Catchy - Taking Plastic Kendamas to the Next Level! Catchy set out to change the stigma of the plastic kendama with their newest product and once you play with it you'll agree they did just that! This is not your average novelty plastic kendama - This is the all new Catchy Air! The Catchy Air is the plastic kendama like it has never been done before. It has a solid feel even though it's see-through, it has a really great weight even though it's hollow, and it's extremely durable even though it's plastic! The unique construction of the Catchy Air actually provides some major benefits over traditional wood kendamas as well. With the injection molded construction there is no guessing how heavy the ken/tama will be; each ken/tama is precise to within a gram of 73.5 grams! And because it is made of POM plastic the Catchy Air is super durable; the tip will not dull and there is no paint to chip or dent over time. Now take a look at the cups; each cup has a rubber o-ring that increases grip to help with balance tricks and dampens noise to help keep your neighbors sane! 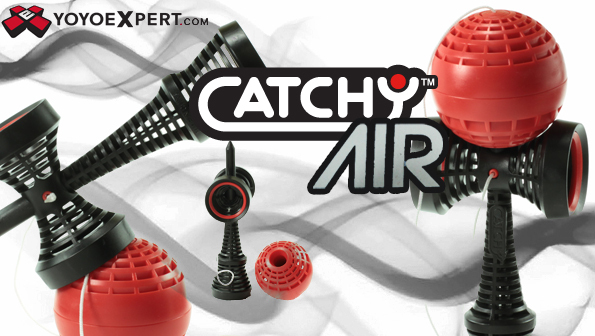 The Catchy Air is a great choice for beginners looking to get into kendama or advanced players looking to practice some new tricks!